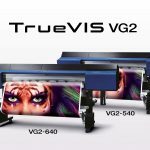 Roland DG Corporation announced the availability of the TrueVIS VG2 Series Print & Cut Solution, the 16th generation of print & cut solutions. It includes new inks, an improved VersaWorks workflow and optional take-up and dryer units, resulting in a system that can be configured to meet the needs of small to mid-sized providers, or of larger providers looking to bring additional capacity. This includes commercial printers looking to enter the sign & display graphics business to generate new revenue streams, capture new customers, and increase the value of existing customers with a compact, easy-to-use and efficient system. 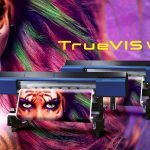 The TrueVIS VG2 Series includes more than 40 new or improved features, ranging from accuracy and quality to workflow and stability, as well as the ability to produce new applications. When combined, small changes create a significant performance increase. For example, a busy print service provider looking for fast turnaround is now able to print, laminate, and apply graphics in one day with the assurance of high-quality output and reliable installation. This enables print professionals to meet their customers’ expectations and to beat their competitors’ time to market. In addition, using a solution that combines printer and cutter in one footprint offers significant productivity advantages, but only if it delivers outstanding quality at an investment level that offers an exceptional ROI. That’s where the new Roland TrueVIS VG2 mid-level production printer, available in 54” and 64” configurations with 4 to 8 colors, comes in. The many small improvements this printer/cutter offers over its previous generation – in addition to its benchmark position in the cut & print world – make it the solution of choice for any serious buyer. You can read here more about the new features and capabilities for the TrueVIS VG2.